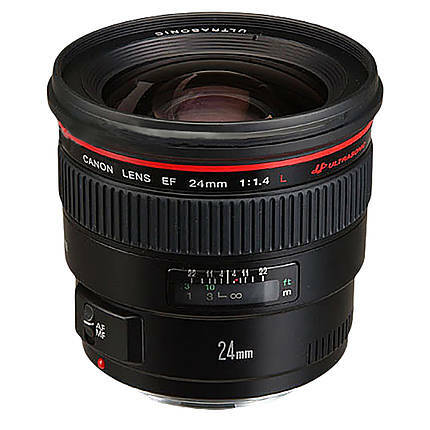 Reliable and fast, the Canon Wide Angle EF 24mm f/1.4L USM Autofocus Lens is the ideal tool for every passionate photographer or photojournalist. It features a ring-type USM motor, which facilitates a full-time manual focusing override without the hassle of requiring a switchover from AF to MF mode. This lens is constructed from pure lead-free glass, which makes it safe to use. In addition to safety, the lead-free glass also has ultra-low dispersion and replicated aspherical lens elements. The former helps in reducing lateral chromatic aberrations while the latter suppresses image distortion and spherical aberrations respectively. Furthermore, this lens offers a viewing angle of 84°. The measurement of something from end to end. Lens Min. Focus Distance: 6.9"
This is the minimum and maximum aperture of a lens.